Gareth Southgate has placed his full trust in the two youngest members of his latest England squad, admiting they're ready for a starting role. Chelsea's Callum Hudson-Odoi, along with Jadon Sancho, are the fledglings being thrown into the gauntlet after their international manager has backed them for battle. Hudson-Odoi in particularly may have not even been mentioned amongst his senior peers until injuries to key members of the Lions left the door wide open for the 18-year-old to step up. His Premier League game time is hugely inferior to his well established England squad members, accumulating a mere 119 minutes of topflight football this season, without scoring. In comparison, Sancho has taken the Bundesliga by storm with Borussia Dortmund, leading the way for assists (12), with 26 appearances to his name. Chelsea’s starlet has found his feet in the Europa League however, scoring four times and assisting two more in his eight matches; no player has completed more successful dribbles in the competition, 30 in total. This has clearly caught the attention of Southgate, supporting his willingness to play the youthful pair. "It's difficult to say really because throughout the age groups, they've been very similar in their development," Southgate told Sky Sports, in response to which of talented wingers would get the nod in the starting line-up. "Jadon has obviously had more big match experience at this point and, he has been with us, as the senior team, for a bit longer. "But Callum has fitted in brilliantly and I won't hesitate to start either of them in the game, they're ready, they can play no problem for us." Sancho is now expected to begin the game against the Czech Republic in their 2020 European Championship qualifier, with Hudson-Odoi waiting eagerly in the wings. 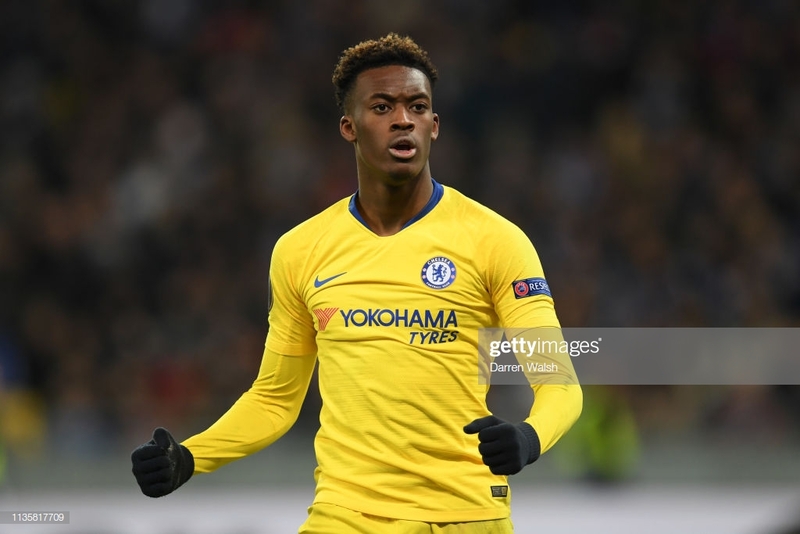 Southgate is not the only man in the England set-up who has high ambitions for Hudson-Odoi. Aidy Boothroyd originally selected him in his own U21 squad for their forthcoming friendlies before Southgate snapped up the Blue's forward for his own gain. Hudson-Odoi has featured 28 times for the youth sides before his big leap, a sizeable amount more than he’s generated at club level. However, Boothroyd believes that he has the potential to start not only internationally, but anywhere domestically, saying: "I have been very impressed with him whenever I have seen him, whether it be coming on as a sub or starting a game. Sancho has set the standards for English players playing abroad and Hudson-Odoi may follow his fresh footprints over to Germany with a move to Bayern Munich in the pipeline. Boothroyd is all too aware of Hudson-Odoi’s situation, plus his lack of time on the field, understanding why a change of country could be appealing. “Our aim is to get as many of our players playing in the Premier League as we can. As it's happened, foreign clubs have tried to take the best English talent produced by English coaches.